Count me in the minority who firmly believe signing Andrei Markov to a 35+ contract worth 3 years x $5.75 million AAV was a very bad idea. Simply put, too much term and too much coin for a player who'll turn 36 in December and entering a stage of his career where he's little more than a power play support piece. Signing such a deal MIGHT have made some sense in the two or three years following the 2003-04 lockout, when a power play specialist was indeed a valuable commodity but in an era of far greater dependency on 5v5 offense to win hockey games, it’s wasteful spending. Most people defending the Markov signing are doing do with the primary belief he’s the straw that stirs Subban’s drink, forgetting of course that Markov stopped being his regular 5v5 partner before the Christmas break and were a horrible even strength pairing the entire time. Just how bad you ask? Going into the break, Markov had just 2 non-power play points (1 SH & 1 EV) while paired with Subban, who had 5 through 38 games. Markov would go on to score 10 more the rest of the regular season away from Subban while PK’s new partners, namely offensive notables Josh Gorges and Frankie Bouillon combined for 8. 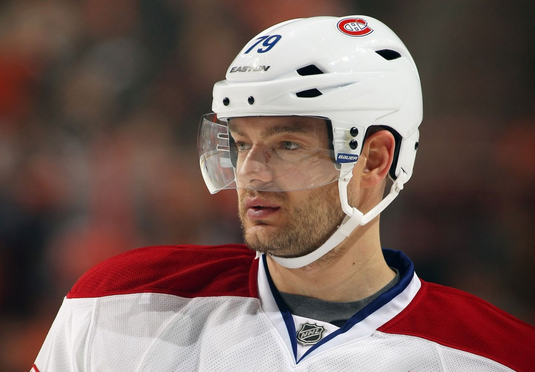 How many power play points did Markov score without Subban? The number you're looking for is Zero. Once away from Markov after Christmas, Subban went on to score 12 more even strength points and 11 of those were either goals and first assists… with Gorges and Bouillon as his main partner. Imagine what he could do paired with a positive possession puck-mover? Given the zone time and minutes, Andrei Markov put up very pedestrian even strength numbers so his main value is feeding pucks to P.K. Subban on the power play, while defenders increasingly cheat towards him and taking their chances with Markov. Not an ideal situation. Retaining Markov also means one or both of Emelin and Beaulieu will continue to be asked to play their off-side at even strength, unless Gorges is traded. Beaulieu has been very reluctant to use his slap shot which removes the one-timer from his repertoire, at least in the short term so that’s a concern for any secondary power play offense. That leaves Subban as the only D in the top 5 with the mobility, puck possession and consistently accurate shot to score from distance, on a defensive squad that was one of the worst even strength scoring units in the NHL last year… on a team that’s had a very difficult time maintaining a positive even strength scoring differential for more than 10 years. I’d much prefer to see Marc Bergevin sign players whose biggest asset was driving even strength possession into the opponent’s end, not players (hello Daniel Briere) with fading even strength game that can't be compensated for on a power play that matters far less to winning games than it used to. And when you spend almost $6 million on a defenseman, you want an even strength horse, not immediately hope Bergevin finds him a puck rushing partner and Therrien cuts his TOI. Copyright © 2007-2011 HabsWatch. Powered by Blogger.